Jean-Jacques Baronnat is over twenty years as head of the family trading house founded in 1920 and well established in the Beaujolais region, but also in Burgundy and in more southern regions. the colour of this wine is pale salmon-pink , brilliant, his nose reveals a delicately fruity palate dominated by red fruit. 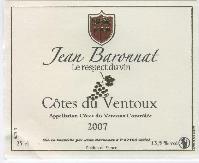 Jean-Jacques Baronnat selected a chardonnay with aromas and toasted brioche embellished with floral notes. The round mouth and vinous evolution reveals a beautiful and intense excitement. To appreciate the aperitif or with foie gras. This wine releases much of freshness. The ruby to purple tints offers a beautiful shine. The nose is fruity mixed with notes of leather. The mouth is in unison on the fruit and liveliness. A drink in the year with a plate of white meat. The deductible is what best characterizes this wine, with a colour green gold, nose expressive, almost muscat. Sharpness, corps and intense aromas of white flowers and yellow fruit make it a complete wine to drink now or in a year. 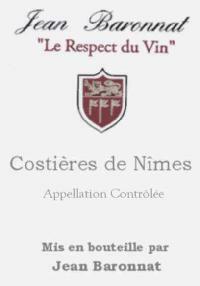 This elegant Wine fruity and winy, a blend of four grape varieties. Velvety in the mouth, the 2006 reveals aromas of cherry brandy, brandy and candied fruit.